The California State University and University of California systems are working together to elevate the importance of collaborative science and ensure that all team members receive credit for their discoveries. In the modern era of innovation, few discoveries are the result of one researcher’s brilliance. They require teams of investigators to tackle pressing problems from different angles and disciplines. Yet universities are still grappling with how to manage team science, reward collaboration and leverage the benefits of having researchers of all genders and races participate fully. Studies show that women and underrepresented minorities often do not receive fair credit for their contributions to research teams, resulting in less research support, longer lapses between promotion and less influence at an institution. 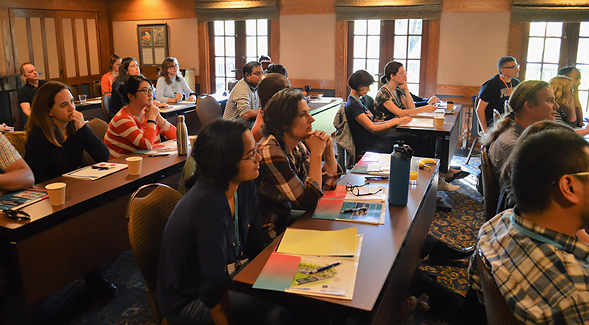 Enter the Center for Research, Excellence, and Diversity in Team Science (CREDITS), whose annual three-day retreat in Lake Arrowhead in late September addressed these difficult issues. CREDITS, overseen by UC Santa Barbara, San Diego State University, CSU Channel Islands and UC Merced, hosts roughly 60 researchers, faculty and administrators from across the 33 UC and CSU campuses each year at its fall conference. 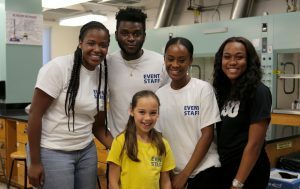 The center receives funding from a National Science Foundation program that aims to increase diversity in STEM research. The goals are twofold: help administrators identify ways their institutions can support collaborative science and encourage research teams to operate without bias; and support female and underrepresented minority researchers in understanding and overcoming the barriers they may face on collaborative teams. “We’re thinking about the pathways to transformation and how we shift culture to support research excellence and make universities diverse and inclusive scientific communities,” said Rebecca Lewison, SDSU biology professor and co-leader of CREDITS. CREDITS’ efforts are driven by research that illuminates the struggles women and minorities face on research teams. For example, in meetings, these groups are interrupted at a much higher rate, receive less eye contact and are given more undesirable tasks than their peers. And studies show that when women and minorities co-author academic papers, their contributions are discounted, making milestones like tenure harder to reach. CREDITS offers ways for female and minority faculty to address current academic culture, providing a toolkit of strategies like amplifying their underrepresented colleagues’ ideas, keeping detailed records of their contributions, and moderating team discussions so everyone can contribute. “You get so inundated with problems and disparities but not solutions, so the suggestions and solutions have been incredibly valuable,” said Elinne Becket, an assistant professor at CSU San Marcos. In surveys distributed directly after the retreat and again six months later, researchers reported increased confidence in pursuing team science and a better understanding of how to promote diversity on scientific teams. CREDITS also shows university administrators how their institutions can value collaborative science and increase diversity on research teams. Methods can be as simple as having leaders consistently use language that emphasizes collaboration and diversity to more complex approaches, such as changing tenure policies to reward collaboration. A recent Elsevier Foundation review of tenure policies at 55 universities found only 41 percent acknowledged team science. CREDITS co-leader Barbara Endemaño Walker, who works in research development at UC Santa Barbara, notes that team science is incredibly beneficial to the universities that support it, leading to high-impact research and robust funding opportunities.